The Breath-Powered USB Charger is an interesting creation from instructables.com. The device scavenges power from your breathing and lets you keep the power as electricity for USB devices. Using some parts scavenged from an old CD-ROM drive, a simple electronic circuit, and a few rubber bands you will soon be huffing and puffing your way to fully-charged pseudo-useful electronic gadget nirvana. Check out the 40+ stories about Dune-related fictional technologies and real-life science. 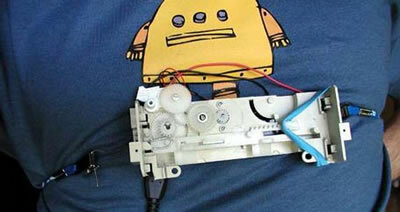 From instructables via Treehugger.